What size am I? 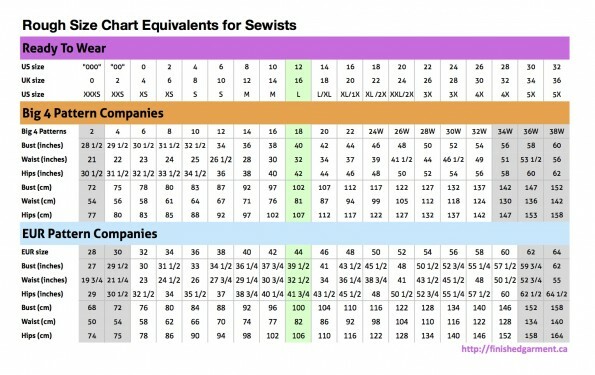 Rough size equivalents for sewists. Thanks Shannon! That is interesting. Your comparison table is awesome! Thank you for sharing. What are the RTW sizes based on (ie who’s the source)? I thought RTW sizes are highly unreliable as retailers / manufacturers all do vanity sizing nowadays and frequently use different fit models depending on their target audience. So that there is no reliable standards in RTW sizing anymore. I guess what I’m trying to say is would it not be better for sewers to just forget RTW sizing and start with their own key measurements? Standard US clothing sizes can be found here. These sizes were developed by statisticians, using a federal grant and as a project for the the US National Bureau of Standards. Their team measured almost 15,000 women across the US in order to develop this sizing system. Later studies have confirmed that this sample was, at the time, representative of the population. Standard EU clothing sizes can be found here. They were developed by the European standards committee and became the de facto standard in the EU in 2007. This chart is a rough sizing comparison guide. Many new sewists find it useful to see an approximate RTW size, in a comparison chart. I’m not a new sewist, and I find it useful. Which is why I built the chart and am now sharing it.